Our programs in planetary science, cosmochemistry, selenology and meteorites are among the best in the country. We are an important research group in the “Chang E” lunar mission. Our faculty tackles a wide range of problems, from theoretical modeling to actual exploration, and from data analyzing to simulated experiments. We probe the surface of the Moon and the planets using remote sensing data, laboratory measurements, and computer modeling. We study both the ancient geological process of the Moon and its ongoing activity on its surface. Moving outward from the Moon, we study planets, their interiors, surfaces, atmospheres, and particle and field environments. A central theme of the Department's researchers is to understand the origin and evolution of the solar system, the planets, and the Earth itself. The Department sponsors a wide range of academic and recreational events. Many distinguished visitors and guest lecturers in all relevant specialties come to CLPS each year, providing valuable interactions which benefit everyone. Tens open talks are given each year by these visitors and by our own faculty, students, and researchers. Several formal and informal gatherings and recreational activities add to departmental spirit. Interests: Lunar and planetary surface environment; space weathering; remote sensing; space resources utilization; meteorite; genesis of planets. Interests: Lunar and planetary surface environment; space weathering; microwave remote sensing; space resources utilization; meteorite; genesis of planets. Interests: Lunar and planetary surface environment; space weathering; microwave remote sensing; space resources utilization. Interests: meteorites; planets; genesis of planets. Key technology of oxygen and water production in lunar base. A Review of Lunar-surface Temperature Model, Li Xiong-yao, Wang Shi-jie,Cheng An-yun. Advances in Earth Science, 2007, 22(5): 480~485. A lunar surface effective solar irradiance real—time model, Xiong-Yao Li, Shi-Jie Wang, An-Yun Cheng. Chinese Journal of Geophsicas, 2008, 51(1): 25~30. Complex Permittivity of Rock and Mineral Measured by Rectangular Cavity Perturbation Method, Li Xiongyao, Feng Junming, Wang Shijie, Zheng Yongchun. Materials Review, 2007, 21(11A),178~180. Measurement of the dielectric properties of Volcanic Scoria and Basalt at 9370MHz. Zheng,Yongchun, Wang,Shijie, Li, Xiongyao. Acta Geologica Sinica, 2005,79(2),801~805. Hong Tang received her bachelor degree at CUGBJ in 2006 and take part in CLPS at the same year. Now she is studying for her doctor degree and the surface environment of moon is her research filed. 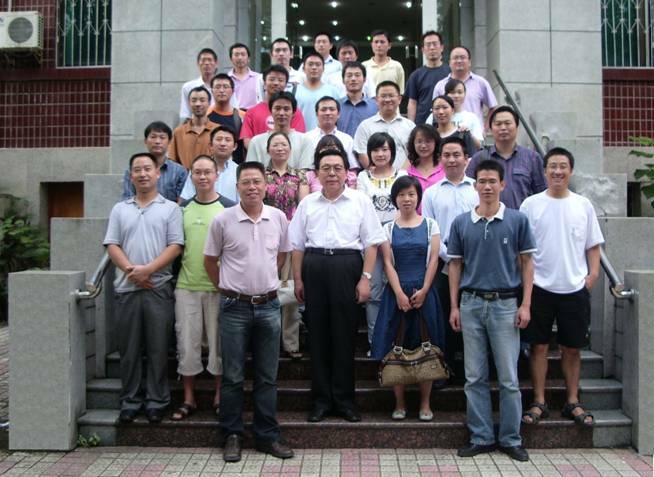 Sensen Zhang received his bachelor degree at XJU in 2007 and take part in CLPS in the same year. Now he is studying for his doctor degree and his research filed is analyzing the data of space exploration. Peng Li received her bachelor degree at BUAA in 2006 and take part in CLPS at the same year. Now she is studying for her master degree and her research filed is the exploration of the space resource. Bushe Xin received his bachelor degree at CUGWH in 2002 and take part in CLPS in 2007. Now he is studying for his master degree and his research filed is meteorite. Yang Li received his bachelor degree at KMUST in 2008 and take part in CLPS in the same year. Now he is studying for his master degree and his research filed is moon and planets science. Wen Yu received her bachelor degree at UESTC 2007 and take part in CLPS in 2009. Now she is studying for her master degree and her research filed is moon and planets science.